Cardiac Rehabilitation...Healthy Choices, Longer Lives! is for anyone who has or has had stable angina pectoris, open heart bypass grafting, a heart attack, a stent, angioplasty, valve replacement, or congestive heart failure. enables you to be an informed participant in your recovery process. guides and encourages you to make healthy lifestyle choices and changes. 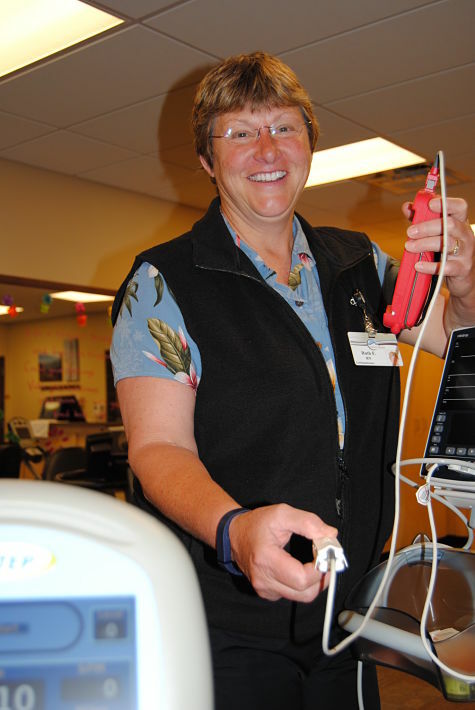 is staffed with an experienced Cardiac Rehabilitation nurse. provides safe, heart monitored, progressive exercise, that is closely monitored by your doctor. offers education, exercise training, dietary support, and psychological support that speeds the recovery process. provides much needed health/wellness services to our communities. affords you the convenience to heal. is covered by Medicare and most private insurances. Our Financial Resource Counselor can help you determine your coverage. provides a better understanding of your heart and lung function. increases self-esteem and functional wellbeing. provides inside information to your physician. The exercise program helps increase muscle strength, flexibility, and endurance; improves blood circulation; and helps lower cholesterol, blood pressure, and body fat. Each individual exercises at his/her prescribed level according to their medical history and personal goals. To increase awareness of all aspects of heart disease, education is an ongoing part of the program in which patients and family members learn how to modify lifestyles to reduce risk factors. Weekly classes on diet, risk factor recognition, stress awareness, psychosocial support, and medications are included in the program fee. The energetic and caring atmosphere, coupled with the support of fellow patients and staff, promotes emotional and mental recovery. Participants are encouraged to accept the challenge of adapting new habits. A referral from your physician is required in order to participate in the program. The time to live is NOW! We are excited to help you back to a more healthy, active lifestyle!